New York Pizza School . When it comes to New York every one knows that we make great pizza. Then what better place is there then to come learn then The Pizza School of New York. We been making amazing pizza for over 24 years and are 4 time International pizza champions as well. So if you want to learn the art of pizza there is only one place to do it! Pizza Consulting at the Pizza School. Come learn with the master himself. 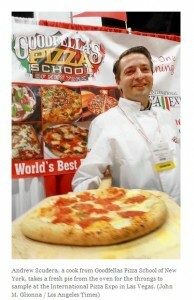 All classes are live one on one and taught by the world champion pizza master himself Andrew Scudera . The only way to learn and the best way to learn is all hands on and that’s our approach. You will be making dough, sauce and managing every aspect of it every day. Its the practical experience that makes people into real pizza professionals, and that’s what we focus on. If you want to learn the art of pizza, gourmet pizza that will set you aside from any competition. In today’s market you have to be different and you have to be great! That’s what we like to teach people; how to make all kinds of incredible pizza with gourmet sauces and toppings. You can learn how to make Vodka sauces, Cheese sauces, gourmet dessert pizzas , breads, calzones, salad pizza and all kinds of amazing creations that you can feature as your own signature pizzas. New York Pizza School .